This tour offers a comprehensive introduction to this varied, ancient and extraordinarily beautiful country Mongolia. Traveling overland in safari style, you will visit the ancient capital at Karakorum, where you will visit the legendary 15th century Erdene Zuu monastery. You will then visit the vast expanses of the Gobi Desert, where you will explore the glacial canyon of Yolyn Am, and the red cliffs of Bayanzag, where the world’s richest deposits of dinosaur fossils are found. You will also visit Hustai National Park, where Takhi wild horses inhabit with other wildlife in the wilderness. Day 01 Arrival in Ulaanbaatar in Mongolia. Transfer to hotel. Day 10 Fly back to U.S. or extend your trip to China/Tibet. Upon arrival at the airport in Ulaanbaatar, you will be met and transferred to hotel. Rest of the afternoon at leisure or just walk around the main square, closer to your hotel. After breakfast, meet your English speaking tour guide and visit the Gandan Monastery and its 26m Gilded Buddha Statue and take part in the morning chants. Later drive out of the town and head south toward the Gobi Desert. The scenery gradually changes into steppe and hills, and enjoy the beautiful scenery. After lunch at Mandalgobi town, continue to the Tsagaan Suvarga, which can be translated as White Stupa – a beautiful white cliff formation in the Gobi steppes. Enjoy hiking and photography at the White Stupas. Check into Ger camp, dinner and overnight. Today we drive to the beautiful Gobi Gurvan Saikhan Park, stopping for photography. Eagles overhead scour the desert for prey, while below families of nomads gather for felt-making, or stand in groups beside their livestock at the scattered wells. Your route passes the 'Three Beauties', the final peaks of the range, and then cuts through the range itself. Enjoy walking in the Yolyn Am Gorge with sights of wildlife. Transfer to Ger camp near the Gorge, dinner and overnight. Yoliin Am (Vulture’s Gorge) is one of the natural secret of Gobi Gurvan Saikhan National Park and beautiful deep canyon with many rocky cliffs. It has been created by many years of water erosion. Very wide at the entrance, it narrows gradually into a remarkably beautiful gorge. A spring 2 miles long winds its way through the valley and in July, freezing into a thick corridor of ice that stretches along a considerable distance. In earlier times, the blocks of ice rarely melted, being protected from the sunlight. This, however has changed in recent years, partially because of global warming. You can still see chunks of ice here in summer, but it is almost completely melted by the middle of August. Following the canyon to the very end, one emerges into a beautiful wide valley. Surrounding mountains are home to many rare wildlife such as Argali wild sheep, Ibex, and many birds of prey, as well as numerous small rodent endemic to the Gobi. A small museum marks the entrance to the protected zone and provides information on the petrified trees, fauna and flora of the Gobi. The visit to the canyon is enjoyed the most while walking ( less than a mile one way). This morning take a drive to the Khongor sand dunes – Mongolia’s largest and most beautiful sand dunes that stretch over 125 miles in the arid Gobi Desert. The drive to the dunes at Khongoriin takes some 3-4 hours, passing through vast desert badlands that span out into the furthest distances, where remote mountains line the horizon. Lone gers and nomads on camelback hang suspended in the mirages, whist the desert floor is strewn with a range of colorful rocks and unusual minerals. This is the Gobi at its stark best - there are many opportunities to stop and take photographs of the landscapes and people. Arrive and check into Ger camp. Then visit the sand dunes, climbing and photo opportunities and enjoy a short camel ride at sunset. Free morning at the beautiful sand dunes. Then transfer to a Ger camp near the Bayanzag Flaming Cliffs, and have lunch. Watch the documentary about the Flaming Cliffs & its’ importance – it’s the place where American explorer Roy Chapman Andrews found dinosaur eggs for the 1st time. Then visit the Bayanzag. Enjoy the wilderness and unique nature formations. Explore around for dinosaur remains and walking in the rich saxaul forest. You can even find real dinosaur bones and eggs yourself! Watch the inspiring Gobi sunset over the Flaming Cliffs in the evening. Transfer to the Ger camp, dinner and overnight. Bayanzag is a valley once covered with the Gobi saxual trees, and is now a beautiful combination of the Gobi landscape, red earth cliffs, sands and the strong saxaul trees. In the 1920s, American explorer Roy Chapman Andrews made Bayanzag world famous (or vice versa) as he found nests of dinosaur eggs – the first ones the world has seen, as well as well-preserved fossils many unknown dinosaur species from here during his big expedition in Asia. Some of his findings are still displayed in the Natural History Museum in New York (it’s documented that his findings were loaded onto the backs of 70 camels!). The name Flaming Cliffs was claimed to be given by Mr. Andrews himself due to fact that the earth cliffs looked incredibly beautiful and red during sunset and sunrise. Breakfast, then start heading to the north toward the ancient capital Karakorum. Enjoy the views of the Mongolian Gobi steppes, break the journey at the Ongi monastery ruins, transfer to Ger camp and have lunch. Visit the Ongi monastery ruins that once represented the biggest settlement in Southern Mongolia with over 1000 monks but was destroyed during 1930s, communist purges in Mongolia. Enjoy some optional hiking in the evening. Dinner and rest at the Ger camp. This morning you head to the north through the green grasslands of Central Mongolia with a visit to a nomadic family, where we will see how the nomads make dairies including Airgag – the famous Mongolian fermented horse milk drink. Have picnic lunch on the way and reach Karakorum village in the early evening. Visit the Karakorum museum and learn more about the Orkhon River Valley – a UNESCO World Heritage site in Mongolia. You may wish to enjoy optional horse riding in the Orkhon river valley. Transfer to ger camp and overnight. Karakorum is the ancient capital of the Mongol Empire; whose ruins lie on the upper Orhon River in north-central Mongolia. The site of Karakorum may have been first settled about 750. In 1220 Genghis Khan, the great Mongol conqueror, established his headquarters there and used it as a base for his invasion of China. In 1267 the capital was moved to Khanbaliq (modern Beijing) by Kublai Khan, greatest of the successors of Genghis Khan and founder of the Mongol Yüan dynasty (1206–1368) in China. In 1235 Genghis Khan’s son and successor, Ögödei, surrounded Karakorum with walls and built a rectangular palace supported by 64 wooden columns standing on granite bases. Many brick buildings, 12 shamanistic shrines, and two mosques were once part of the city, which also was an early center for sculpture, especially noteworthy for its great stone tortoises. After the fall of Mongol Yuan Dynasty in Beijing, the Mongol royals were back to Karakorum. And in the 1400s, Chinese Ming soldiers burnt Karakorum twice. Later in the 1500s the city was partially rebuilt but was subsequently abandoned. However, in 1586 a Mongol prince started building Erdene Zuu monastery, which today remains only as a museum, was built on the city site. After breakfast, visit the legendary monastery Erdene Zuu, the first Buddhist monastery in Central Mongolia founded in 1586, Museum of Karakorum and its surroundings such as the Turtle Rock and the Phallic stone etc. Lunch at the Ger camp. Then drive to Hustai National Park, where the Takhi wild horses inhabit with other wildlife in wilderness. Arrive and visit the national park info center and take some hiking to view the Takhi wild horses. After breakfast, drive to Ulaanbaatar , and upon arrival visit the National Museum of Mongolia. Lunch at Ulaanbaatar and visit the Bogd Khan’s Palace Museum & the Zaisan Memorial Hill. Later transfer to hotel and check-in. Afterwards you will have some free time to visit cashmere/souvenir shops if you like to do some shopping. In the evening, there’s a traditional folk concert followed by farewell dinner. Transfer to airport and fly back home or extend your trip to China & Tibet. Airport transfers with private vehicle. Sightseeing tour with entrance fees. The sooner you book, the better it is, because getting lower airfare from U.S. is higher when you book well in advance. Also, it is hard to get rooms in some of the hotels if it is closer to departure date. You can usually make the international flight reservation nine months prior to your departure date. You get a visa free of cost upon arrival at the airport in Mongolia, if you are traveling with U.S. passport. All the other permits and entrance fees are included in the trip. The best time to take this trip is from May to early September. The weather generally stays nice and is not cold. At the time of booking, you need to send us $ 350.00 deposit with a trip application form. $ 1000 is due 3 months prior to departure, and balance is due 2 months prior to departure. This is an easy trip. However, you have to be physically fit to do the tour. 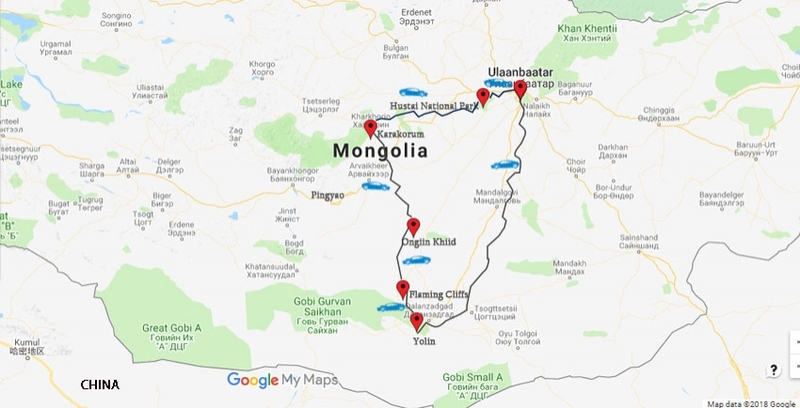 You will be spending from around 8 AM to 4 PM touring around, going from one place to another taking drive and enjoying the nature and experiencing the local culture and way of life in Mongolia. You will be staying in comfortable accommodation with attached bath in the city of Ulaanbaatar. Outside the city, you will be staying in Ger or Lodges with shared bathroom. Private bathroom at some places are available with the supplement cost of $ 250.00 per person/subject to availability. Yes, you can extend your trip to China, Tibet or destinations in Asia. You may like to inform this at the time of booking the trip, should you book the international flight with us. We would be happy to arrange your extension as well.